The Original Evans Air Conditioning and Heating | Service, Maintenance, Installation and More! The mission of the Awards Program is to promote the importance of conducting business ethically and the efforts made by outstanding organizations to ensure our marketplace remains fair and honorable to everyone,” said Mechele Agbayani Mills, President and CEO of BBB Serving Central East Texas. “Today more than ever it’s necessary that we spotlight and celebrate companies in our region who operate with integrity and who can serve as role models for other organizations. 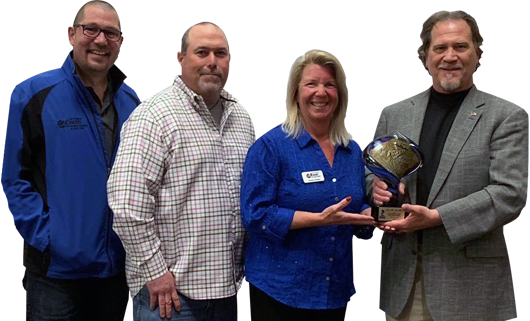 The BBB Award for Excellence recipient for the Mid-Size Business Category is The Original Evans Air Conditioning and Heating. We offer the peace of mind service you can trust. At The Original Evans Air Conditioning & Heating, we work every day to ensure our customers are completely satisfied with our services. If you’re looking for heating and air conditioning services in the Smith County area, you’ve come to the right place! We’ve spent decades creating happy customers. Our goal is to maintain that high rate of customer satisfaction by continuing to work hard to keep our customers happy by meeting their individual needs. Thanks to an array of services like HVAC installation, sales, repairs, and preventative maintenance, we’re able to provide comfort to both residential and commercial customers in East Texas. Evans Air provides installation services and repairs for all brands of residential and commercial heating and cooling systems in East Texas. We provide Servicing and more for all brands of HVAC equipment! Click below to see all of our services. Looking for an estimate on an HVAC install, Duct Replacement, Solar Equipment, Furnaces or more? You wouldn't drive 100,00 Miles without changing your car's oil, would you? Avoid System Failure! Use our Lennox Savings Calculator to find out how much money you could be saving on your electric bill! Not sure about HVAC Maintenance? Not sure if it's time to have maintenance done on your heating and air conditioning system? Check out our guide! Once in the spring. Once in the fall. Once at your request. Whether you’re a residential customer seeking a brand new heating and cooling system for your home or a business looking to create a comfortable environment for your customers, we’re your one-stop shop. We perform maintenance and repairs on all brands and sell the components you need to keep your system running during the hottest and coldest months of the year. Our technicians have the in-depth knowledge necessary to serve the HVAC needs of residential and commercial clients throughout East Texas. We’ll work with you to help you stay comfortable while saving thousands of dollars a year on your heating and cooling costs. Contact The Original Evans Air Conditioning & Heating today! And everything betwixt and between!